Democrat Bill Monning currently represents Senate District 17 and will not be termed out until 2020. Monning is expected to easily win re-election in 2016. Senator William W. Monning was elected in November of 2012 to represent the 17th Senate District, which includes all of San Luis Obispo and Santa Cruz Counties, and portions of Monterey and Santa Clara Counties. 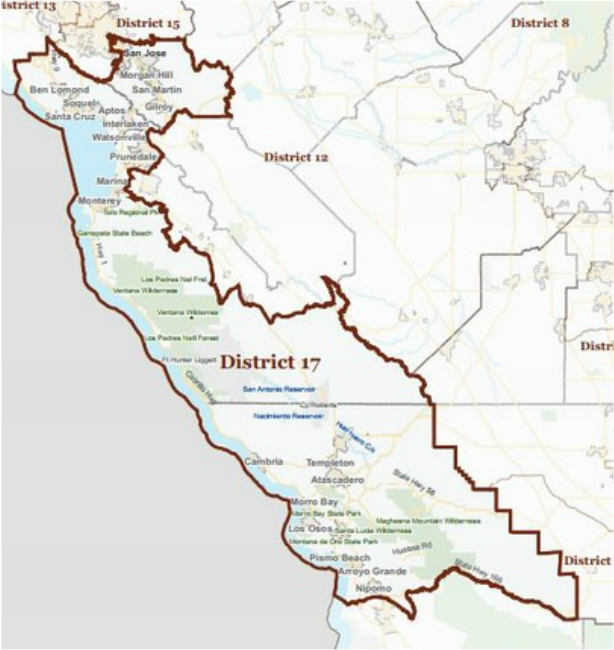 Prior to that, he represented the 27th Assembly District from 2008 to 2012, which included portions of Monterey, Santa Cruz, and Santa Clara Counties. Currently, Senator Monning is the Chair of the Senate Committee on Insurance, which has jurisdiction over commercial, auto, homeowners, and life insurance issues. He also serves as a member of the Senate Committees on Budget, Education, Health, Judiciary, Natural Resources and Water, and the Budget Subcommittee #3 on Health and Human Services. During his tenure in the state Legislature, the Senator has been a leading advocate of reducing childhood obesity and other preventable chronic illnesses through the reduction of the consumption of sugar sweetened beverages. He has authored legislation that would have established a sugar sweetened beverage tax with the revenues generated dedicated to support childhood obesity prevention activities and programs throughout the state. This year, the Senator authored legislation to place a consumer-warning label on sugar-sweetened beverages, which contain 75 calories or more per 12 ounces, sold in California. Senator Monning has also been a long-time supporter of the California Central Coast State Veterans Cemetery at Fort Ord and has provided leadership at the state level to provide the funding necessary for its construction. Additionally, he has been active in bringing together a diverse group of stakeholders and developing a strategy to develop the Coastal Trail in the Big Sur area, as well as working with state and local agencies to ensure the removal of the San Clemente Dam to achieve safety and ecological benefits. When he was a member of the Assembly, the Senator was instrumental in establishing the California Health Benefits Exchange, a key component for California to implement federal health care reform. The primary function of the Exchange is to be California’s “active purchaser” of health care coverage for individuals and small businesses that generally do not have access to affordable health care. He also authored landmark legislation that requires the Ocean Protection Council to establish a statewide standard for the certification of sustainable seafood. Prior to his service in the State Legislature, Senator Monning was a professor at the Monterey College of Law and a professor of International Negotiation and Conflict Resolution at the Monterey Institute of International Studies. He is the former president and co-founder of Global Majority, Inc., an organization committed to education, training and advocacy in the field of non-violent conflict resolution. Senator Monning served as a Senior Fulbright Specialist, receiving Fulbright scholarships to teach and research in Peru and Chile. Additionally, he was a member of the Monterey County court-directed mediation panel and served for four years as Executive Director of the Nobel Peace Prize winning organization, International Physicians for the Prevention of Nuclear War. The Senator received a B.A. at the University of California at Berkeley and a law degree from the University of San Francisco, School of Law. He and his wife, Dana T. Kent, a family physician, reside in Carmel, California and have two daughters: Laura, husband Kevin (2 grandchildren); and Alexandra, husband Lucas.